Megan and Gretchen are thrilled to announce that they’ll be using their podcast to provide free coaching for listeners. In order to submit questions, please email us here or post questions at the bottom of this blog entry. Am I behind with my applications yet? How long does it take to get transcripts sent to all the colleges my daughter is applying to? 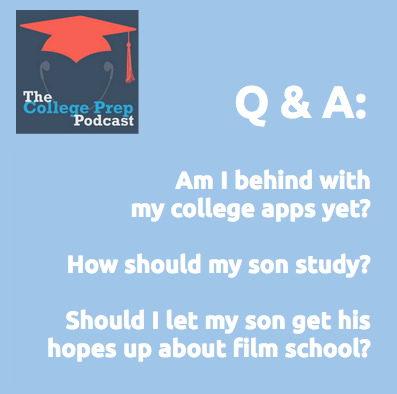 How can I make sure my son, who is in middle school, is learning study skills. Why don’t school teach this? 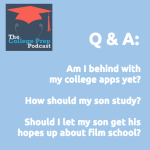 My son — who has ADHD, dyslexia and a mediocre GPA –wants to go to film school at University of Texas. He has little chance of getting in. Should we apply and get my son’s hopes up?